Looking to make your own DIY makeup setting spray? We break down 5 different kind-to-skin recipes that are easy to make from home. Plus, we reveal the most common mistakes made when creating homemade setting sprays! Are you a skincare newbie? We also breakdown all the benefits for each ingredient. Keep reading to find out how to make your own makeup setting spray! ♡ Why Bother With Setting Spray? ♡ Essential Oils - The Best One For Your Skin Type! A good setting spray provides longer lasting makeup so you won’t need to touch up your makeup. Nothing worse than a melting face when you go out with friends straight from the office! Spray in between every step in your makeup routine to blend everything together. Not a fan of makeup? The mist is cooling on bare, fresh skin. Plus, you can add beneficial ingredients to nourish your skin when you spray. Evian’s facial mist water spray was quite popular in recent years. It’s not a makeup setting spray – it’s a facial mist. But did you know that the sole ingredient in the spray is Evian water? You can easily make something similar at home that will actually set your makeup with added nourishing ingredients for a skin boost! DIY makeup setting spray often contains better ingredients than branded options on the market. Some makeup setting sprays are packed full of good ‘setting’ ingredients that unfortunately may irritate your skin. Alcohol based setting sprays typically work best, but they can cause dryness or aggravate your skin. While branded setting sprays work great with a light mist for a night out, they’re typically not recommended for daily use. A full breakdown of each ingredient and its benefits is included below. Make sure you read the essential oils section to find the best one for your skin type. Check out the ‘common mistakes’ portion to avoid ruining your homemade setting spray! Grab a (preferably glass) bottle with a spray top end to hold your concoction. Use a funnel to transfer the liquids if you find it difficult to keep your hand steady. Once you’ve added all the ingredients to the bottle, be sure to close and shake the bottle well. Store the setting spray in the fridge to help prolong its shelf life. Only create small amounts of setting spray at any one time. Commercial makeup setting sprays contain preservatives – these natural DIY alternatives will not last as long! Check the essential oil guide below to find out which essential oil is best for your skin type! Brew the green tea bag in boiling water for at least 5-10 minutes. Remove the tea bag and let the brewed tea cool. If you can’t get your hands on glycerin or rose water, this is a good option. It probably won’t set your makeup as well as the other recipes will, but it’s good for your skin and better than nothing. This recipe is a great option for acne prone skin (especially with tea tree oil!) because of all the acne busting ingredients. Water straight from the tap often contains contaminants and can grow bacteria in a relatively short amount of time. If you’re using water in your spray, be sure to use purified distilled or bottled water. If you do use tap water be sure to keep your mixture refrigerated and use it up quickly. There’s some debate over whether witch hazel works well for oily skin. Witch hazel is an astringent. Many claim astringents help to reduce oiliness. However, some dermatologists warn that the skin can over compensate for the oil stripping effects – leading to more oil production. Others maintain that witch hazel doesn’t dry out the skin like other (unnatural) astringents can. There’s also debate over whether or not it’s okay to store essential oils in plastic containers. For pure essential oils, airtight glass bottles are better because plastic and rubber bottles can be damaged by potent essential oils. While glass is always preferable, sometimes plastic storage is okay. The essential oils must be mixed with other ingredients and sufficiently diluted for storage in a plastic container. Store your diy makeup setting spray in a cool, dark place to avoid early expiration from sunlight. Applying certain types of essential oils and exposing your skin to the light can cause a chemical reaction on your skin called photosensitivity. Your skin may experience burning, itching, redness, discoloration, inflammation, or blistering in the sun after applying certain essential oils! Essential oils that contain furocoumarins are photosensitive. Some of the most common photosensitive essential oils are citrus based, including: grapefruit, lime, and lemon. However, other citrus oils (including tangerine, blood orange, and red mandarin) are not photosensitive. Tea tree oil can also cause photosensitivity. When in doubt, avoid sunlight, tanning beds, or any other form of harsh light for up to 24 hours after applying a potentially photosensitive diy makeup setting spray. Mario Badescu’s facial mist/setting spray is made of rosewater, aloe, and herbs. While rose water is a little more expensive than other ingredients, it really amps up your face spray and helps your makeup stay in place for longer. It’s worth the extra investment. Plus, you can use the left over rose water as a toner! Just like witch hazel it’s an astringent. 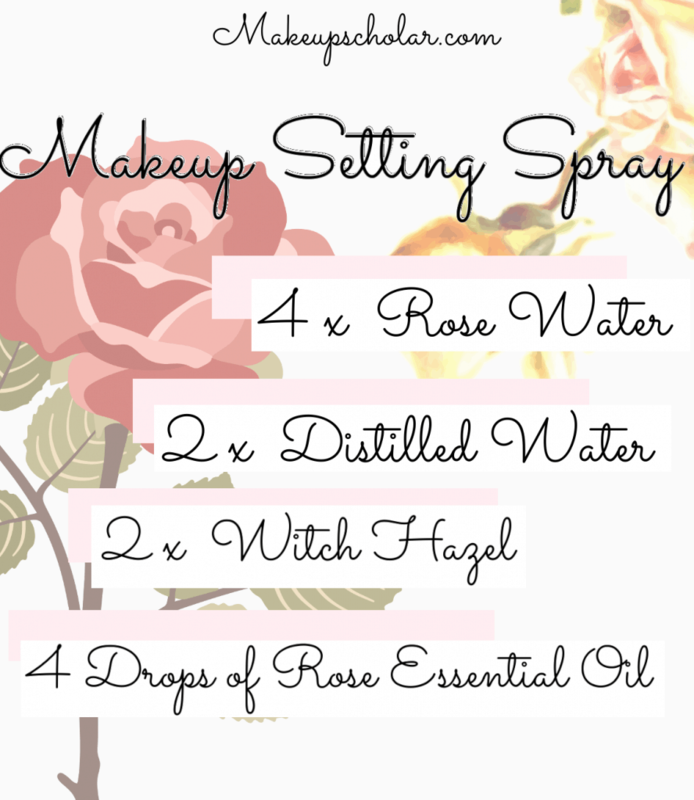 Rose water feels nice and cooling on the skin, and adds a great smell to your setting spray. It’s ideal to refresh your skin when your makeup is looking a little dull. Rose water is packed full of skin care benefits, too. It soothes, tones, and moisturizes. This ingredient is commonly added to branded makeup setting sprays for a longer lasting full face. An excellent addition to keep your makeup in place, vegetable glycerin is a sugar alcohol made from plant oils. It’s created by melting together vegetable fats and a strong alkali. It may sound like an unusual ingredient, but it’s commonly found in many makeup products (especially primers), soaps, lotions, and even in toothpaste! Unsurprising since it’s commonly used to create base primers, it works well to help makeup adhere to the skin and stay in place all day. There are some potential health benefits of vegetable glycerin according to certain research papers. Glycerin is hydrating and gives a nice dewy finish to the skin. Do not add too much or it could make your face too oily. Great if you have sensitive skin – studies have found witch hazel relieves broken, sensitive and irritated skin. Because it’s an astringent and anti-inflammatory, witch hazel is commonly used in acne treatment products. Even better – it’s possible witch hazel helps prevent the spread of melanoma (cancerous) cells! There’s some debate over whether witch hazel works well for oily skin (see the ‘common mistakes’ section above). Wet & Wild’s setting spray contains aloe vera. Perhaps the most well known skincare use of aloe vera gel is to soothe sunburn. Did you know it also acts as a non-greasy moisturizer? Aloe vera acts as an anti-inflammatory and helps heal wounds – it’s great if you suffer from acne, eczema, or other similar skin problems. The aloe leaves are packed full of kind-to-skin antioxidants like vitamin C & E, plus beta carotene – great for ageing skin. Gerard Cosmetics sells a green tea version of their famous Slay All Day setting spray. 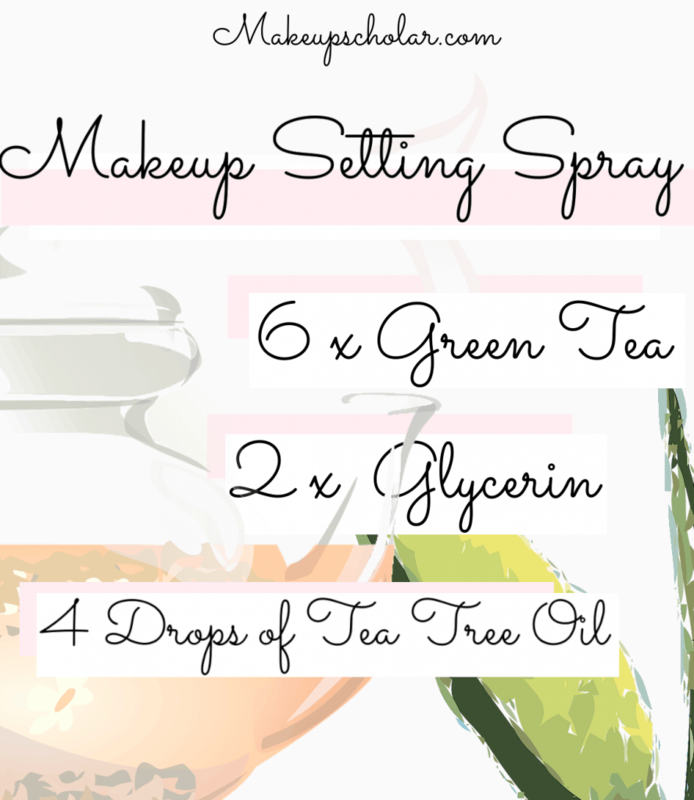 Not just a delicious beverage – green tea is packed full of health benefits and is a great addition to a makeup setting spray! Green tea contains polyphenols that help fight back against acne causing bacteria growth. It’s possible that green tea helps reduce the risk of non-melanoma skin cancer through DNA repair promotion. Check out the acne healing benefits of green tea (and other treatments) here. ♡ Essential Oils – The Best One For Your Skin Type! Essential oils are a great addition to your diy makeup setting spray. Not only do they add a pleasant smell, they also have beneficial properties. By choosing the right essential oil, you can customize your setting spray to suit your skin type. Ylang Ylang not only emits a nice floral scent (similar to lilac), it also help balance oil production. Perfect for oily skin! Additionally, it’s also anti-inflammatory and anti-bacterial – great for problem skin. A floral derived oil, rose essential works great to hydrate dry skin. Plus, it’s great to help reduce the appearance of scars, treat rosacea, and minimise lines on ageing skin, too. This potent oil is well known for acne treatment. While it’s not quite as effective as benzoyl peroxide, it’s much less harsh on the skin and results in less side effects. Read more about tea tree oil’s acne treating powers here. Avoid the sun if you add this oil to your setting spray – tea tree oil can cause photosensitivity! Don’t have any particular skin concerns? Carrot seed essential oil is a great all rounder. This oil helps rejuvenate dull skin, balance oil production, tighten and tone, and soothes sun damage. You may be familiar with carrot seed oil from tanning products. Check out our best outdoor tanning lotions list here. While carrot seed oil has a high SPF content, carrot seed *essential* oil does not! Do not use carrot seed essential oil as an alternative to sunscreen.